And [Jesus] took bread, and gave thanks, and brake it, and gave unto them, saying, This is my body which is given for you: this do in remembrance of me. I learned that the Greek word for bread, ἄρτου, also (significantly to me) designates the shewbread of Old Testament tabernacle/temple covenants. One of life’s greatest blessing is our ability to commune with God. Sacrifice: an act of slaughtering an animal or person or surrendering a possession as an offering to God, an act of giving up something valued for the sake of something else regarded as more important or worthy. Communion: the sharing or exchanging of intimate thoughts and feelings, especially when the exchange is on a mental or spiritual level. 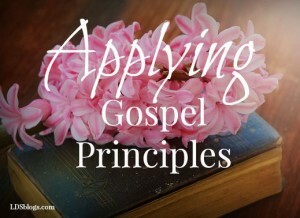 The idea of communion brought waves of scriptures to mind! In a sense, I never felt this applied to me, until considering its relation to the sacrament. And there [in the tabernacle’s holy of holies] I will meet with thee, and I will commune with thee from above the mercy seat…of all things which I will give thee in commandment unto the children of Israel. We have a Savior who sacrifices Himself in every way to ransom us from the effects of the Fall. We have a covenant which requires the sacrifices of our hearts, minds, and wills—that of a contrite heart and spirit. The Savior invites us to Come to Him, to look to Him in every thought, and ultimately in that sanctified communion, He brings us into the Father’s presence for communion eternally in the realms of glory. We invite the Savior into our lives through prayer, supplication, remembering Him, and keeping His commandments. As we always have His Spirit with us, we ask Him to abide with us. Abide with me; ’tis eventide. As I communed with thee. And kept me near thy side. Nor find in thee my light. Would in my home abide. 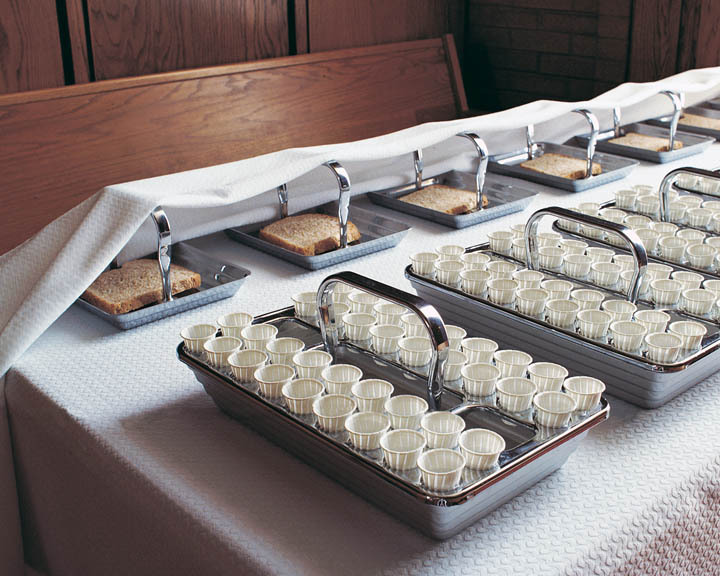 When I compared shewbread to sacrament bread, I realized that while 12 loaves of shewbread represented the 12 Tribes of Israel surrounding the tabernacle, an appropriate number of trays and pieces of bread represent the needs for each sacramental congregation. Instead of Jehovah communing only with the High Priest on appointed days at the mercy seat, He promises to meet each contrite heart at the sacrament table. Communion and sacrifice infuse the divine petition. Like the shewbread which was torn instead of cut, the sacramental bread is torn into individual pieces. The Fall and sin divide and tear, Atoning grace binds and heals. The Savior allowed His body to be torn in remembrance of me, of you, of us. While of this broken bread Humbly we eat, Our thoughts to thee are led In rev’rence sweet. Bruised, broken, torn for us On Calvary’s hill— Thy suff’ring borne for us Lives with us still. Despite His Atonement, because of ourselves or others, we still find ourselves torn and battered in this fallen world. As we seek and apply the Atonement of Jesus Christ, there is hope. The torn emblem of Christ’s body becomes the binding agent of our soul. 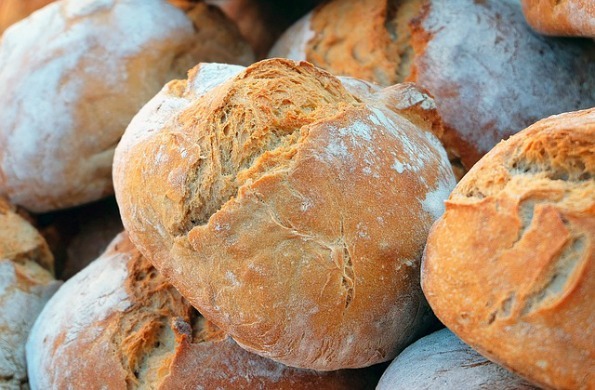 Can we really trust that “bread” can really heal us? Can you imagine humbly approaching the Savior and being rejected? Never! He promises healing and grace to all who recognize He is the source and approach Him. If I ask Him for bread, He gives bread. He showed in so many instances how there is always enough bread for everyone, so He can freely give it. After all, He is the Bread of Life. The day after Jesus miraculously provided bread to a multitude, the multitude clamored for more. The Savior, perceiving their true purposes, exhorted them to seek for eternal life, which He, authorized by the Father, could give them. True bread. Then said they unto him, What shall we do, that we might work the works of God? Jesus answered and said unto them, This is the work of God, that ye believe on him whom he hath sent. They wanted a sign. They noted that Moses gave their fathers manna to eat in the wilderness. Like, if you’re REALLY a prophet, you could give us daily bread to eat, right? I know I still don’t comprehend all He means. But this text is so beautiful and moving to me. I see the eagerness, though misguided, of the crowd to crown a king that will feed them daily. They were the new children of Israel with manna given from heaven! What an exciting thought! But, not only did the Teacher correct their incorrect understanding by saying what they thought wasn’t true, He expanded far beyond what they’d ever comprehended. Bread was a person? And He was that person? They knew him from Nazareth! They knew His parents!! How could He say He came down from heaven like manna? 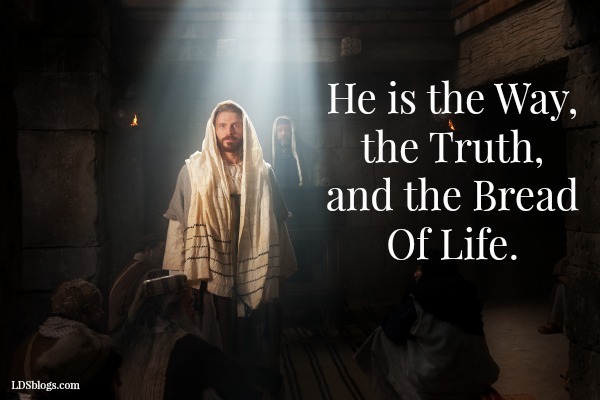 He has the words of eternal life. 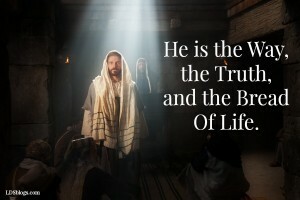 He is the Bread of Life. This is His exposition on the sacrament. But I said unto you, That ye also have seen me, and believe not….The Jews then murmured at him, because he said, I am the bread which came down from heaven. Verily, verily, I say unto you, He that believeth on me hath everlasting life. I am that bread of life. Your fathers did eat manna in the wilderness, and are dead. This is the bread which cometh down from heaven, that a man may eat thereof, and not die. Then Jesus said unto them, Verily, verily, I say unto you, Except ye eat the flesh of the Son of man, and drink his blood, ye have no life in you. Whoso eateth my flesh, and drinketh my blood, hath eternal life; and I will raise him up at the last day. For my flesh is meat indeed, and my blood is drink indeed. He that eateth my flesh, and drinketh my blood, dwelleth in me, and I in him. As the living Father hath sent me, and I live by the Father: so he that eateth me, even he shall live by me.This is that bread which came down from heaven. The Father gives the Bread from heaven to be a consumed salvation. He offers sacrifice and communion always. O God, the Eternal Father, we ask thee in the name of thy Son, Jesus Christ, to bless and sanctify this bread to the souls of all those who partake of it; that they may eat in remembrance of the body of thy Son, and witness unto thee, O God, the Eternal Father, that they are willing to take upon them the name of thy Son, and always remember him, and keep his commandments which he hath given them, that they may always have his Spirit to be with them. While studying bread, ancestral stories popped into mind. Joseph Smith promised five of my ancestors (on both my mother and father’s lines) that because of specific things they did, their descendants would never want for bread. I’ve heard the stories my whole life. In Nauvoo, a great-grandmother generously gave in her lack. Joseph Smith took her hand and powerfully promised her eternal life. He also promised that her children and their children would never want for bread. In a later generation, an unknown visitor asked my destitute great-grandmother for food. She gave and he ate. Then he got up and left without saying a word. She was left without food for her family while her husband served a mission across the sea. She felt devastated at the loss of food to an ungrateful man. The visitor returned to her door and pronounced a strong, prophetic blessing on her posterity that they would not want bread. She ran to the door and the man was nowhere to be seen. A story that is relatively well-known is my great grandfather John Tanner’s story. John Tanner lived very prosperously when the Carter brothers brought the Gospel to New York. In a dream, the Lord commanded him to move his large family to join the Saints in Kirtland. He did and consecrated his wealth to build the Kirtland temple. Before serving a mission in 1844, John Tanner met Joseph Smith on the streets of Nauvoo. But as I considered these lessons I learned about bread, sacrifice and communion, and the times those promises were given to my ancestors, I realized I’d grossly underappreciated my ancestors’ lives and the promise received. The fire of faith has burned brightly in my blood for generations. I’ve never had to seek the Bread of Life like many people have. He’s been available to me and is still available for me. I’ve never wanted for Bread. What does that promise mean to you? It’s not just limited to a family or their descendants! Every member of the Church covenants to be the Savior’s sons and daughters and receive all that He has! Behold, he sendeth an invitation unto all men, for the arms of mercy are extended toward them, and he saith: Repent, and I will receive you. Yea, he saith: Come unto me and ye shall partake of the fruit of the tree of life; yea, ye shall eat and drink of the bread and the waters of life freely. And He offers it to us every week as we partake of the sacrament, His sacrament.